1831: born in Ôsaka in the district of the Dôtonbori river. Son of a carpenter, he is adopted at the age of 3 by Kawachiya Shôbei, the owner of the Kawachiya shibai jaya located within the Chikugo no Shibai. 1838: he starts his career as a disciple of the actor Jitsukawa Enzaburô I, who gives him the name of Jitsukawa Enji in 1840. 1841: Enji stops acting for a few years. 1844: he is back on stage and receives the name of Jitsukawa Enjirô. 1854: quarrel with Jitsukawa Enzaburô I. He leaves the Jitsukawa clan and becomes a travelling actor, nicknamed "Hadaka no Enji" ("Enji the naked"). 10th lunar month of 1856: he settles in Edo and becomes disciple of Nakamura Fukusuke I, who gives him the name of Nakamura Enjaku. 1st lunar month of 1859: he is adopted by Onoe Kikugorô IV and receives the name of Onoe Baikô. 1861: he goes back to Ôsaka. 1862: his master Jitsukawa Enzaburô I forgives him and he is reintegrated in the Jitsukawa clan. 3rd lunar month of 1863: he takes the name of Jitsukawa Enjaku I. Enjaku is in fact an haimyô used by both Jitsukawa Gakujûrô I and Jitsukawa Enzaburô I. 5th lunar month of 1866: Enjaku plays at the Naka no Shibai the role of Danshichi Kurobê in the drama "Natsu Matsuri Naniwa Kagami"; the roles of Tokubê and Sabu are played by Nakamura Komanosuke V and Jitsukawa Gakujûrô II. 9th lunar month of 1868: Enjaku plays at the Kita-Horie Ichi-no-Gawa Shibai (Ôsaka) the role of Abe no Munetô in the "Sodehagi Saimon" scene of the drama "Ôshû Adachi-ga-Hara". His stage partners are Nakamura Sôjûrô (Sodehagi), Arashi Hinasuke VI (Abe no Sadatô) and Nakamura Kanjaku III (Hachiman Tarô). 11th lunar month of 1868: Enjaku plays at the Minamigawa no Shibai the role of Abe no Munetô in the "Sodehagi Saimon" scene of the drama "Ôshû Adachi-ga-Hara" (same casting as the Ôsaka performance). 1872: Enjaku becomes zagashira at the Chikugoza. 1st lunar month of 1872: Enjaku plays at the Chikugo no Shibai the role of Hanzawa Rokurô in the drama "Dan no Ura Kabuto Gunki". His stage partners are Ôtani Tomoemon V (Akoya), Arashi Hinasuke VI (Shigetada) and Arashi Rikan IV (Iwanaga). 5th lunar month of 1872: Enjaku plays at the Minamigawa no Shibai the role of Danshichi Kurobê in the drama "Natsu Matsuri Naniwa Kagami"; the roles of Tokubê and Sabu are played by Ôtani Tomoemon V and Nakamura Shichigasuke. October 1881: premiere at the Ebisuza of Katsu Genzô III's drama "Ogasawara Shorei no Oku no Te"; Enjaku plays the roles of Okada Ryôsuke and Ogasawara Tôtômi-no-Kami [casting]. May 1883: Enjaku plays at the Ebisuza (Ôsaka) the role of Shunkan in the drama "Heike Hyogogashima". His stage partners are Arashi Kitsusaburô IV (Chidori), Jitsukawa Enzaburô III (Tanzaemon), Arashi Rishô II (Naritsune) and Ichikawa Aragorô III (Senoo Tarô). 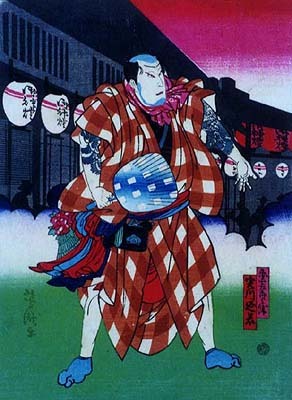 October 1884: Enjaku plays at the Ebisuza (Ôsaka) the roles of Yasuke and Kôemon in the drama "Tengajaya-mura". His stage partners are Arashi Kitsusaburô IV (Iori), Nakamura Ganjirô I (Genjirô), Arashi Rikan IV (Motoemon) and Ichikawa Aragorô III (Tôma). January 1885: Enjaku appears on stage for the last time, at the Ebisuza (Ôsaka), where he plays the role of Tokugawa Yoshinobu in the drama "Shima Chidori Nami no Konohana". Jitsukawa Enjaku I was a small man and his voice was not very good but he overcame it to become one of the most famous Kamigata tachiyaku actors of the Meiji era (along with Nakamura Sôjûrô and Arashi Rikan IV) and the founder of a great line of actors. His field of excellence was wagoto. He suffered a lot in his latter years because of lead poisoning, which crippled the use of his arms, but he kept on acting. Jitsukawa Enjaku I's best roles: Kamiya Jihê ("Shinjû Ten no Amijima"), Kanaya Kingorô ("Kosan Kingorô), Kanô Shirojirô ("Chichi Morai") and Sanigoroshichi ("Kari no Tayori").